Review by Nathan on 3/28/2014. Cool map, but I had to downrank it for a couple of reasons. First, and most importantly, the connections between islands are incredibly difficult to see. The lines linking them are irregular and curvy, which can make it difficult to see which territories they actually connect. They are also white against a fairly bright background, which causes a lot of squinting. This problem is worsened by the inconsistent connections between islands. Why, for instance, doesn't Tortola connect to St. John? Or Grand Bahama to Abaco? It looks like they should on the map, but they do not. Finally re oversea connections, the calligraphic connecting lines don't go all the way to the territories they link. This can make for trouble, as it looks like Saint-Martin could connect to either Fort-de-France or Southern Martinique. Fix these and you have a five-star map. Also - I noted a broken connection between Glades and Martin in Florida. Finally, leave some room on the margins. It makes the bottom easier to see. Review by Mudderducker on 3/28/2014. Including the flags limits the detail on the map itself. You should only really use flags for small maps or for a small amount of flags. Using a flag for every Country does enhance the look of the map, but it reduces the detail of the territory's, as you have to simplify them more. Also it limits the chances of having nice clean borders. Edit: How did I forget the 'connections' please fix, this will be confusing, plus change the colour as well. You may want to try dots? Review by Saramaya on 3/28/2014. There is a problem with Martin territory, in the noth of the map. Can't be attacked by the left ! Not connected. Review by KlaussMarcellus on 8/16/2014. Yes , a really good map . Review by Chessie2003 on 9/1/2014. The Caribbean map has a glut of tiny bonuses that are connected in very unintuitive ways. Navigation alone is difficult and trying to plan out superbonuses just doesn't feel worth it. Review by Robc01 on 4/18/2014. loved the game. really had to watch your back. It is really good for tose with a good strategy. Review by David Rader on 4/22/2014. Review by Ƨillynamenace on 5/14/2014. I agree with the reviews above and I'm looking forward to see the map after your modifications. The only additional thing I'll be critical about will be the stylish label you put at the very center of the map. I'd suggest it should be removed from there, because it is a huge distraction. What about making it smaller and putting it on the top left corner? Review by Hurricane on 7/1/2014. This is a fun easy map. Just takes awhile to move through all the islands. Review by G_GR on 12/11/2014. Review by AlexB on 3/14/2015. Don't like the water color, makes it too hard to see islands and bonuses. Review by OTPM on 12/11/2015. Review by fenty on 1/2/2016. Review by Emma on 1/29/2016. Review by jecowa on 3/24/2016. 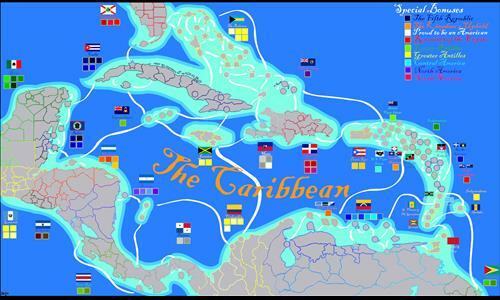 It's a very well-labeled map of the Caribbean. It's good that the author made some of the smaller islands larger to make them easier to see and click, but the connections are a bit confusing. If two territories are touching, I think the player should be able to assume that they are connecting. This is not always the case with the tiny circle islands. It's not just the islands with confusing connections. The connections of Yucatan, Rio Jatate, and Port Au-Prince aren't completely clear from looking either. I think having clear territorial divisions is more important that displaying every province. It's an interesting map, though, and I might play it again sometime. Review by Dogberry on 5/5/2016. This map is a lot of fun, but it is not without its faults. It is basically a giant circle. There are not enough distant connections to prevent it from feeling linear. In many games I have played (all of which were 4 player FFA's), the eventual winner was determined by their picks, with the player with the most room to expand in one of two possible directions inevitably rising to the top. Review by Finny923 on 3/28/2014.